Barley grass is made from young shoots of the barley plant. 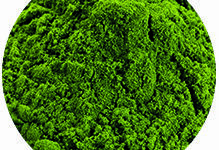 This product is a natural food source of nutrients such as vitamins, minerals and the green plant pigment chlorophyll. It has just about all the nutrients necessary for your body. The vitamins found in Barley grass include beta-carotene, folic acid, pantothenic acid, vitamin B1, vitamin B2. vitamin B6 and vitamin C.
The minerals include potassium, calcium, magnesium, iron, copper, phosphorus, manganese and zinc. Barley grass is also rich in chlorophyll content. Mix 1-2 tablespoon(s) of Barley Grass Powder into juices, smoothies, salad dressing, soups and sauces. For children 1/2 to 1 tablespoon daily.